Your website is constantly evolving. Let me handle all the necessary updates to keep things fresh and secure. On going maintenance & protection to keep your website running safe & securely. You can’t make money if it’s outdated, broken, or offline. Established clients who are looking for a “technical partner” to be their Website Go To Girl™. I handle anything tech related on your website. I keep your site up-to-date & secure. Any support tasks you need done, get handed off to me. Have questions regarding website tech? Send them over for quick, easy to understand answers. I can recommend the right level of support based on your site/business needs. 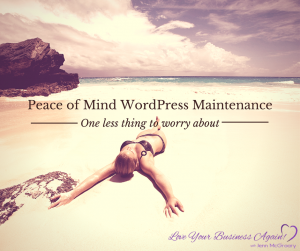 Peace of Mind that your website is maintained & protected so it can perform at the highest level. A partner you can turn to with any questions relating to your website or online marketing. Review the plan options below and then contact me to get you setup.